Do you cringe when your four-year-old asks for a pull-up or, worse, has an accident in public because you didn’t put a pull-up on her? Whether you don’t want to push the issue or your child simply doesn’t want to drop the diapers, potty training is a crucial step in your child’s development. We talked with Dr. Baruch Kushnir, creator of the children’s DVD The Magic Bowl: Potty Training Made Easy, about the negative health consequences of late potty training. When young children become dependent on diapers or pull-ups, they don’t learn how to recognize the need to go to the bathroom. Their inability to control their bladder and bowels at an early age can actually affect their bladder- and bowel-control as they grow older. What is the right age to start potty training? Every child is different and readiness is based on a child’s physical, physiological, cognitive and emotional states. For example, if a child is diagnosed as having physical or mental health problems that hinder her from understanding or being capable of potty training, it should be postponed, regardless of age. In general, however, Dr. Kushnir recommends encouraging your children to become potty trained between the ages of one and three years old. As challenging as potty training may be for some families, it’s crucial for parents to make it a positive and enjoyable experience. 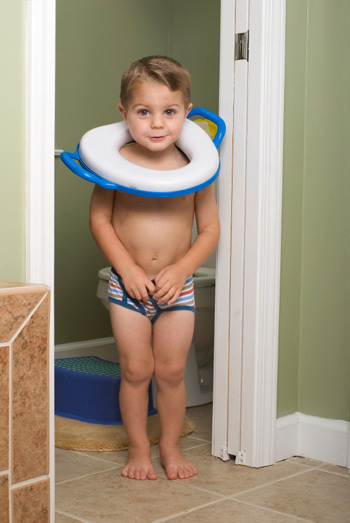 “The subject of toilet training cannot become a source of a power struggle between parents and child,” the child development expert says. “The child should not be allowed to control or dominate the parents by rewarding or punishing them in any way.” Likewise, parents must remember that their personal comfort in potty training is secondary and to always give children the basic feeling that they are loved and appreciated, even when accidents occur.